With her effortless fierce delivery and lyrical poeticism, MC and rapper Raquel Divar is making waves throughout the West Coast underground hip-hop and electronic scenes. Raquel has innovated a style that draws on the traditions of old-school hip-hop, Southern rap, UK grime, dubstep, and trap. Growing up in San Francisco with a brother who was a scratch DJ, Raquel was fascinated with DJ culture, electronica, and hip-hop from a young age. 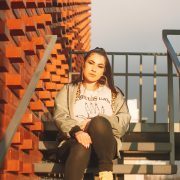 Raquel’s work is highly influenced by acts such as Vince Staples, Nadia Rose, Ms. Banks, Santigold, Foreign Beggars, and renowned underground hip-hop group Hieroglyphics. Raquel has notably collaborated with Portland’s prominent underground bass label and collective STYLSS and Portland’s Tomahawk Recordings, helping her alter the face of rap in bass music. Raquel can often be found performing with Tomahawk Recordings label head Cory O who she released collaborative EP The Reign in 2018. Raquel’s ardent passion, powerful flow, and energy shine through in her live sets. The Willamette Week named Raquel one of Portland’s most underrated rappers in 2016 and “Vandals” one of Portland’s most underrated rap songs of 2017. Divar premiered the music video for ‘Runners Anthem’ on prominent hip-hop blog HipHopDX in late 2018, the video has garnished over 66K thus far. Kicking off 2019 with a fierce forward collaborative all female rap single titled ‘Renegade’ featuring Portland rapper KayelaJ and touring Seattle, San Francisco and Bosie with more festival dates to be announced. Raquel will release her music video for ‘Dopamine’ in April 2019. Divar advocates for the equal treatment of women in the entertainment industry and is currently working on her first solo full length.